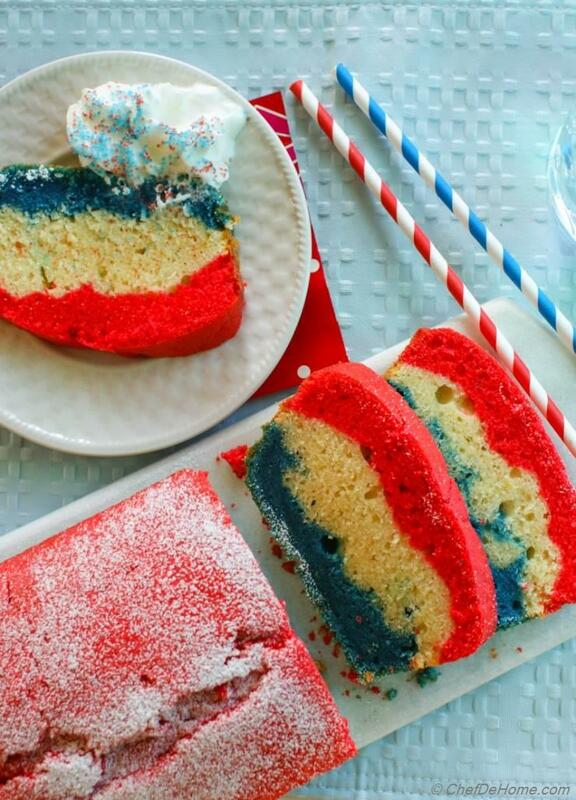 Sharing with you a delicious, rich and moist pound cake with patriotic theme. 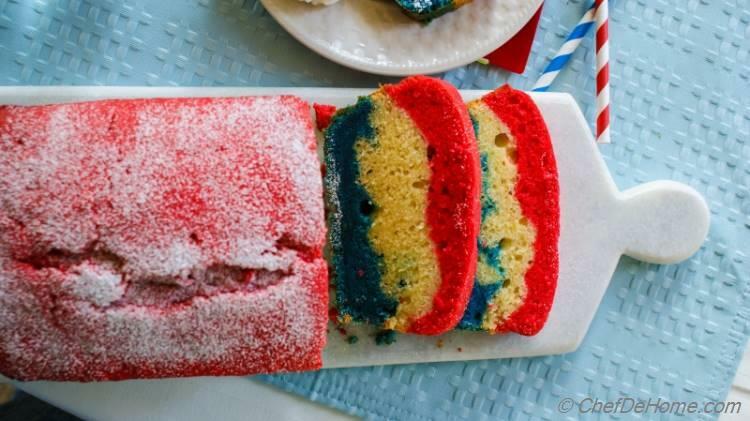 Are you looking for a delicious pound cake recipe? This super recipe will complete your search. 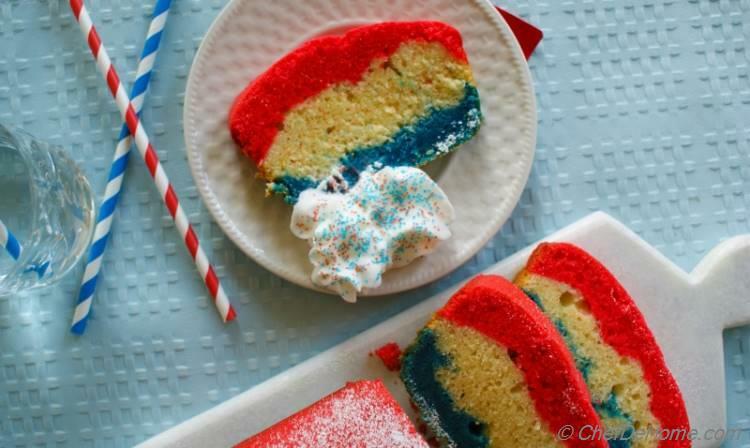 Or if you forget to plan dessert for memorial day lunch or looking for a patriotic theme dessert? 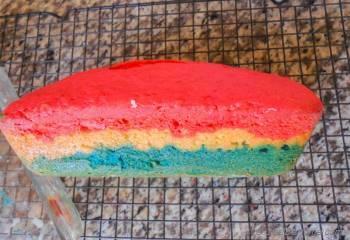 then beautiful tri-color cake will save your day. Three ingredients make a pound cake rich and deliciously moist and that are sour cream, sour cream and sour cream. Yes, no writing errors here!! Sour cream makes a pound cake moist, rich and buttery delicious. Also if it is at room temperature then your recipe will not go wrong ever!! 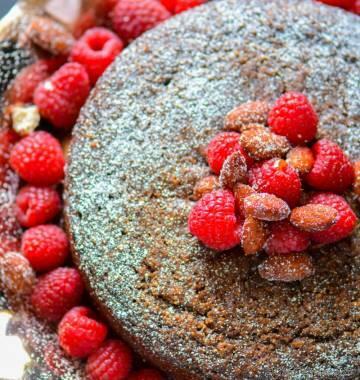 In-fact, for baking a good moist and lite cake, room temperature ingredients are as important as eggs and butter. 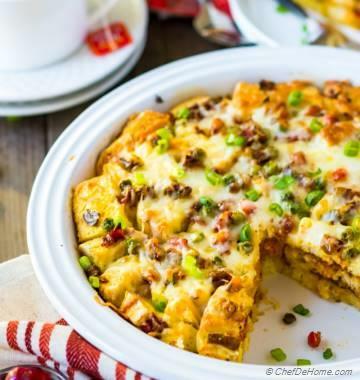 As a rule of thumb, take out all refrigerated ingredients like butter, milk, eggs, sour cream at least 2 hours before baking to insure they are at room temperature. If you live in warmer areas, keep'em out for 1 hour. What if you forget to take'em out? Then follow few baking tricks. Dip eggs in lukewarm water for 20 minutes to bring them to normal temperature. Warm milk or butter in microwave for 5 seconds at a time and then touch to feel the temperature. 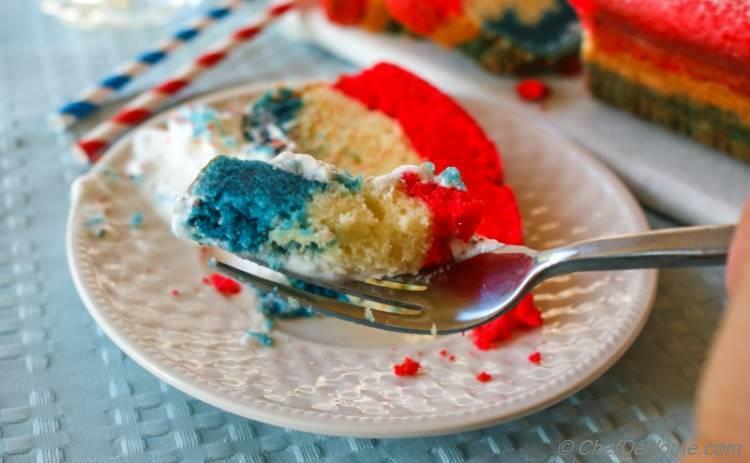 Have you decided to bake anything sweet for memorial day? Or you still planning to look some recipes tomorrow? 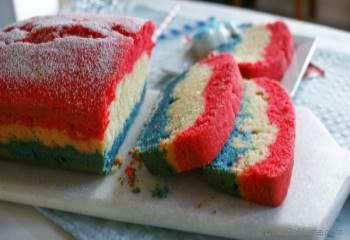 If you still thinking then this patriotic pound cake recipe will save your day. I suggest, please don't opt for those store bought cup cakes with tri-color butter icing in hurry. 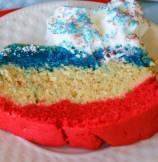 Instead, bake this fresh, lite sweet, rich and fun Patriotic Pound Cake. 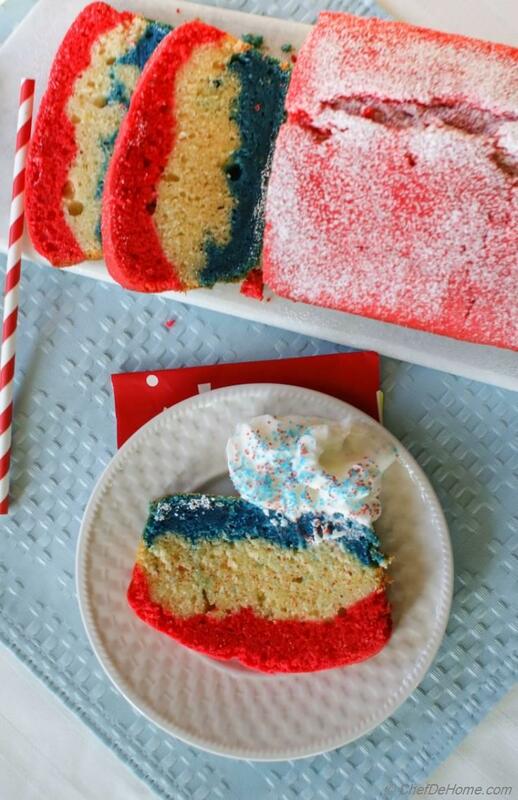 From start to finish, patriotic pound cake will ready in just 90 minutes. And it looks so pretty, don't need icing or decoration! Just serve with fresh whipped cream and red-blue sugar sprinkles. 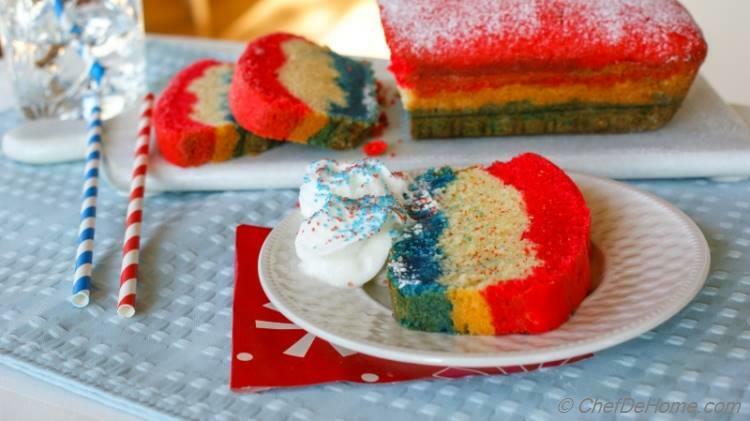 Kids will love it and everyone else will be impressed with richness and moist quality of the cake. Hope everyone enjoying long Memorial Day weekend and family times together. 1. Pre heat oven to 325 F. Using a hand mixer or stand mixer, cream together room temperature butter and sugar until pale yellow in color. 3. With mixer running at low add 2 eggs (one at a time), blending well after adding each egg. 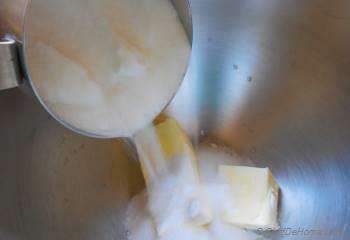 Also add vanilla extract, lemon zest, lemon juice and sour cream while mixing. 4. Boil 1/4 cup of water. In two separate small bowls, mix 2 tbsp. water and 20 drops of red and blue colors each. Also sift together flour, soda and salt and set aside. 5. 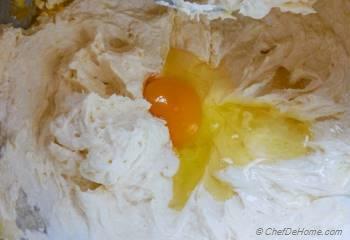 Divide egg and butter mixture in three parts and add to three medium size bowls. 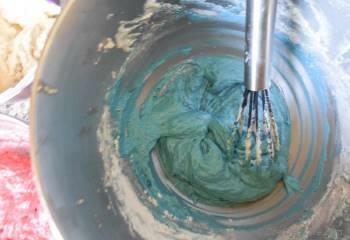 Mix in blue color first bowl, add one third of flour mixture to the bowl. Combine with gentle strokes until streaks white disappear. Set aside. 6. 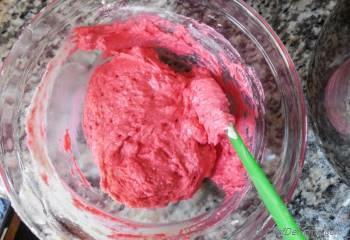 Mix in red color in second bowl, add one third of flour mixture to the bowl. Combine with gentle strokes until streaks of white disappear. Set aside. 7. 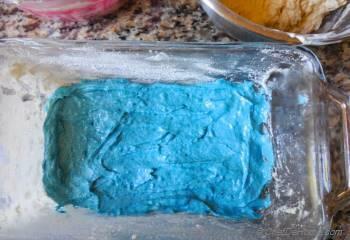 Layer the blue color batter in the bottom of buttered loaf pan. Gently even the layer with spatula. 8. 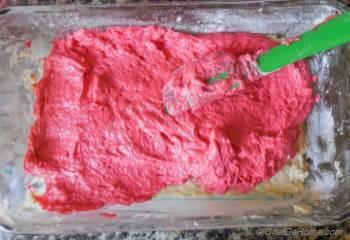 Top it with white color batter and then with red color batter. Tap after each layer to even the layer as much as possible. 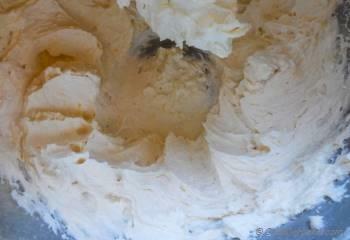 Do not press the batter or mix too much or layer will not be distinct. 9. Bake for 70 minutes or until tooth pick inserted in the cake comes out clean. Leave the cake on kitchen counter for 5 minutes. 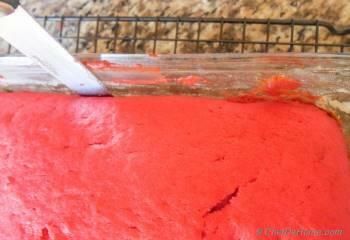 Then loosen the edges with knife and flip the cake on cooling rack. 10. Invert the cake on its side. Cool the cake completely before slicing. 11. 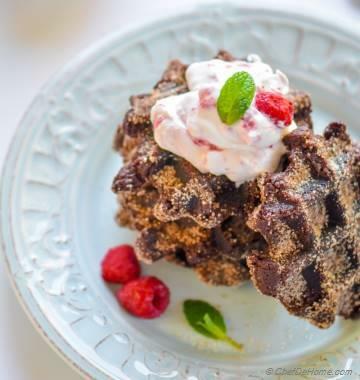 Serve with sweetened whipped cream and red and blue sugar sprinkles. Gauri, thanks for kind words, dear! Its beautiful Savita !Loved it! Thanks @Kristen. It tastes great too, a must try! !